It's easy to make fun of Brett Favre, a National Football League quarterback so famous even Lord Wife knows who he is. She was once moved to remark, "Why do those announcers just keep repeating the words 'Brett Far-vuh, Brett Far-vuh' like some kind of &*$#ed-up bird call...did he get back from prison or something?" Admittedly, this post is just to get me rolling over a steep blog-slump borne of unspeakably gorgeous, teasingly tenuous Seattle springtime sun that could get shut down going into the summer like Mariners' batters facing Mariano Rivera in the 8th inning of the 2001 ALCS. The trade-offs of radiation plus children, travel, and time have resulted in a pathetic recent pace of one post per week. It's more parental gulag than semi-retirement, with swim lessons, bikes, strollers, eating fries in Tangletown under Hornitos sunbrellas, Adirondack chairs on stone patios and being condemned to perpetual chauffeur and bodyguard duties (my true callings) in relentlessly nice weather. Thankfully, Favre is thinking of coming out of his 3rd, 4th, 5th or 6th (depends who you ask) retirement to play another season in the NFL. Why would he do this? Many point to his competitiveness, his love for the game, how he holds the known records for consecutive quarterback starts and for vomiting on sidelines and in games. Some have said he might want the record for interceptions thrown (310), but I just looked it up--he already owned that by 2007. Others suspect life on the road suits him and the little sum'pins he might have on the side, but he's made enough money to buy his own team. The Green Bay Packers offered him 20 million dollars to retire and he turned it down. I, having known all along he would never retire while he was physically able to roll his shotgun arm back to the huddle on degenerative hips, know why he won't. His father was his high school football coach, dying on a Sunday in 2003. 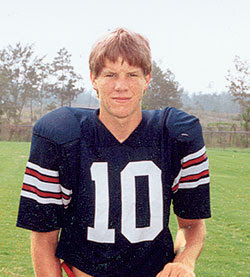 Favre played the following Monday Night game against the Oakland Raiders, throwing four touchdowns in the first half enroute to a 41-7 victory. Brett Favre still plays for his dad, and to deny death. I'm sitting here in an office in Milwaukee under twin framed Sports Illustrated covers of Favre. They seem to still be in denial that he's gone. They still wear #4 Packers jerseys to work on fall Saturdays. Welcome back. Now where the f*@# did I go? It was to an ok place. Not as nice as Florida, maybe, but people here start complaining of heat stroke when it hits 80 degrees, and it got there a few times, touching 90 once. Milwaukee? I thought you'd gone skinny-kayaking down the Sound with Mrs. Perils. PS--word is that Favre will play for the Vikings. That'll really mess with their cheese-heads. Oh, don't I know all about the parental gulag...and Lil' Bee is only 3. I hear it just goes downhill from here.